Lytle Creek League of Conservators/No Child Left Indoors volunteers and Cowan Lake State Park are partnering in pursuit of the goal of reconnecting kids to nature. 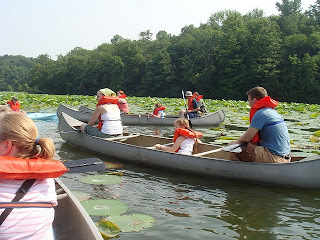 This is a great opportunity to introduce children to the lifelong activity of canoeing. Wednesday, June 29, starting at 10am Cowan Lake State Park Naturalist, Erin Shaw, will lead a guided canoe tour of Cowan Lake to explore the creek inlets and beautiful Lotus Cove area of the park. Canoes and lifejackets will be provided. This activity is FREE to participants and is geared toward children ages 5-14. We will focus on safety and proper paddling techniques, and of course, fun. This is a great opportunity to introduce your children to the fun activity of canoeing at one of the Ohio’s most beautiful state parks. Please note that parents or adult companions must stay with the children during the event. (And why would you not want to be part of the fun?) Registration is limited due to the number of canoes available, so register online here or call Lori Williams (937) 725-3811.